Within the theme’s backend you may customize the appearance (colors, typography) of every elemnt in your website. White and Dark skins included for all these too! Gazette Magazine looks great on any device and screen size. We have ensured that all elements scale down in a beautiful manner so the end user experience simply feels great! Gazette only loads the items that are going to be displayed on the screen, preloading everything else while the user focuses on the current screen. A fully fledged, highly customizable, easy-to-use review system comes packed with the Gazette theme. If you plan using any of these amazing social plugins (BuddyPress, bbPress), Gazette integrates just fine with them. You may assign a diferrent color for any category so users can easily distinguish the topics. Gazette comes packed with over 40 shortcodes designed to be used with the theme itself as well as a shortcode generator so you don’t have to write a piece of code yourself at all. Besides all this, it comes bundled with the Shortcodes Ultimate plugin so you can write content in any style you think of! Generic sidebars for the entire layout are now long gone. With Gazette you can create and assign a diferrent sidebar to any post / page / gallery type if you wish to. We’ve made it easy and intuitive to use for everyone. It comes packed with an extensive amount of options and they are well described so you can get a better understanding of what each option does. The Admin Panel comes with no branding so your clients don’t know that you’re actually using a theme for their website! Gazette comes packed with 8 custom widgets to extend it’s functionality. .po files have been included for the theme so it can be translated in any language. All Gazette’s elements have been worked to display just right if using a RTL (right-to-left) language. To make the layout even more interesting, you can adjust the site’s width, the content vs sidebar proportions, the padding of various elements, etc. Gazette was crafted with SEO in mind. Using Gazette you’ll have a SEO ready website with no effort and no additional plugins! Extend the functionality of native WordPress’ menus with megamenus! Impress your customers! Being a magazine, it’s so easy to use a featured youtube / vimeo video for your articles instead of featured images. Gazette Magazine runs on a very powerful, bug-free, battle-tested framework so we ensure our customers that all our features simply work out of the box! Blazing support & free updated for life. If you consider purchasing Gazette Magazine, keep in mind that whenever you need help, we’re here for it! We pledge to keep our theme constatly updated and bug-free. Customer satisfaction is our priority. 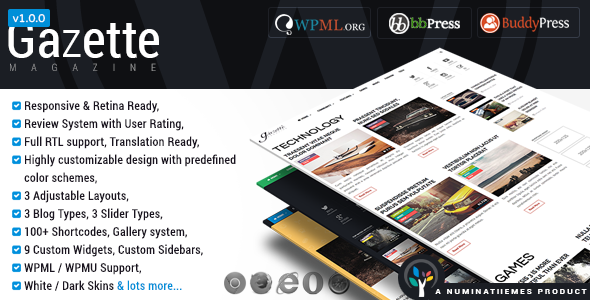 If you have purchased and used our theme, we strongly encourage you to give it a honest rating. It helps us take care of our existing products and continue developing even more awesome WordPress themes! This entry was posted in Wordpress Themes and tagged animated, colors, depositfiles.com, download free, download rar, download theme.rar, download theme.zip, download wordpress theme, download zip, editorial, free, free wordpress theme, gallery, get rar, get zip, Index Of, magazine, mirrorcreator.com, news, nowdownload.ch, nulled, nulled theme, Parent Directory, rar, rating, retina, review, rtl, ul.to, zip, zippyshare.com by wordpress. Bookmark the permalink.